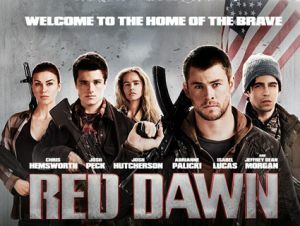 A remake of the 1984 film Red Dawn came out last week and really did not do very well. I cannot believe they even re-made this film, because it makes no sense in today’s world. Back in 1984 the Cold War was still in effect, and the threat of a Soviet invasion felt possible. The remake casts North Korea as the bad guys. If I were to compile a list of dangerous threats to America, “Invasion by North Korea” would probably come in at around #97. The 1984 Red Dawn was a cautionary tale of preparation, the 2012 Red Dawn (which I haven’t seen) sounds more like a fantasy film. It makes no sense. Now films that make no sense are released by Hollywood all the time, and they usually end up failing and forgotten. That’s just Hollywood. In the rush to remake older successful films, you would think Hollywood would put a little thought into it. Since sometimes it seems Hollywood doesn’t think. Here are 6 other successful movies from the 80’s and 90’s that, like Red Dawn, should NOT be remade, because in today’s world the plots make no sense. 9 to 5 (1980) – The plot then: Three victims of a sexist boss kidnap said boss and start to run the company better without the boss around. The plot today: Three victims of a sexist boss sue the company for millions of dollars, the company declares bankruptcy, gets bought out by corporate raiders and all the jobs are shipped to China. Just One Of The Guys (1985) – The plot then: A female journalism student who thinks she would get more respect as a man transfers to another school as a male journalism student, and finds out the male students don’t have it so easy either. Much havoc ensues when she finally reveals her true gender. The Plot Today: A female blogger starts a new blog under a male alias, decides to start pretending to be a male, only to find out there are 4 or 5 other transsexual students at the school, and nobody really cares. Top Gun (1986) – The plot then: Ace American fighter pilots get in dog fights with Soviet Air Force. Gets plane shot down. Co-pilot dies. The Plot Today: Ace American Drone pilot flies with no opposition over Taliban forces. Gets drone shot down by a lucky shot. Because he lives in Nevada, and the drone is half way around the world, he takes the afternoon off. Pump Up The Volume (1990) – The plot then: Teen starts a pirate radio station, his obscene antics cause an uproar in the town, gets in trouble with FCC. The plot today: Teen starts audio podcast, his obscene antics gets some followers, the FCC doesn’t give a damn. Hackers (1995) – The plot then: A tiny handful of computer geniuses conspire to take over computer networks and the world. The plot today: A tiny handful of computer geniuses discover that being good at computers is very common, and networks are very protected, and interrupting network communication is amazingly uncool today, and will land you in jail and shunned by geeks everywhere. The plot today: A couple of people in the same business meet online anonymously, but thanks to Google, Linkd-In, and Facebook they find out everything about each other in a few minutes. Can you think of any other recent popular movies that cannot be remade because the plot makes no sense today? Throw them in the comments. Next Article Video Games Don’t Kill People, Guns Do! At the risk of sounding stupid here, I think most past movies can be at least a little modernized while being good. It’s just that with a lot of remakes, movie companies don’t feel like trying hard enough to do so. That’s why for me, it’s been hard to pick a movie in the 1980’s or 1990’s that can’t be remade. However, Tron from 1982 may be one of those movies because the evil AI and the evil corporate executive in that get out of business by the end of the movie. It’d be a lot harder to infiltrate or even put out of business an evil corporate executive today without more people involved or more hacking involved if you set Tron in modern day. Also, lasers can’t teleport or transport people into computers by modern standards. Even if there was some way to transfer people into computers, it would most likely mean leaving the physical body behind. This means the way by which the hero is put into the computer becomes much more complex than Tron originally intended. All of this means that the three heroes would be caught easily by modern standards, if you didn’t change a thing besides it being at least a little modernized. That’s the closest plot I can think of that can’t make sense today and is in the 1980’s. I limited the movies I listed to movies that at the time of their release were set in the present day. If remade, one would assume the remake would be set in the present day too. Sci-fi, Fantasy, historic, or futuristic films do not need to play by the rules of modern life and could easily be remade. Tron Legacies came out two years ago and had all the problems you cited, but being a sci-fi fantasy film we looked the other way. Sci-fi films often don’t make sense. It is often pointed out that the entire plot of Twilight New Moon (Edward thinks Bella is dead, Bella rushes to Italy to prove she is not) could have been solved with a phone call. The invention of cell phones, texting, and their widespread use has ruined many plots. People making desperate phone calls and the person they are trying to reach not being at home is a plot trope that cannot be used anymore. Luckily writers find ways to incorporate cell phones into new plot tropes, like a person seeing a cell phone text message they shouldn’t have seen. Well, just because Tron is the closest thing I can think of to fit those categories doesn’t mean it can’t be remade successfully. I also realize that the movie examples you gave aren’t sci-fi, fantasy, or futuristic…but are grounded in reality for the times that they were released in. Unfortunately, movies grounded in reality that I’ve watched and are set earlier than the twenty first century are easy to make into modernized movies because they’re not able to be quickly solved through modern plot holes. So, I can’t think of any other example to have than a science fiction movie or a fantasy movie. But since Tron seems to not count as a movie example here, I’m sure many other users would agree with you on that note(unless I’m wrong about that). The plot then.Three prehistoric tribesmen search for a new fire source. The plot today. Three pot heads go to the 7-11 to buy a bic lighter for their bong. Hi Ariane – wow, your website & blog are amazing! I can’t believe I’m only discovering them now, but wow – beautiful work! Breakdown (1997) – Then: Kurt Russell’s car breaks down, his wife hitches a ride with a “friendly” trucker to a local diner that has a pay phone in order to call a tow truck, and then she disappears. Now: Kurt calls up his OnStar account; the OnStar rep runs a remote diagnostic and sees that there’s a loose wire, tells Kurt where to reconnect it, and gets him back on his way again in about ten minutes. Home Alone (1990) – Then: Macaulay Culkin is accidentally left behind when his family leaves for Christmas, lives on his own for several days, and foils an attempted burglary of his house with a little help from a friendly neighbor. Now: Macaulay’s neighbor reports to Child Protective Services that the boy has been left alone in the house, CPS immediately comes and takes him away and places him in foster care. When the rest of the family gets home, police don’t notice that the house has been burglarized in his absence because they’re there to arrest the parents for felony child endangerment. Road House (1989) – Then: Patrick Swayze takes a job at the Double Deuce, a rowdy small-town bar, battles a wealthy man who has the entire town under his thumb,and saves the town and the business. Now: Double Deuce shuts down long before Patrick ever gets there, after scathingly negative reviews on Yelp and Barmeister and videos of bar fights at the Deuce posted on Youtube drive all of its customers away. Trading Places (1983) – far, far too many changes in commodities market laws and trading practices (including online and after-hours trading) in the last 30 years to even begin to imagine how a remake would work.